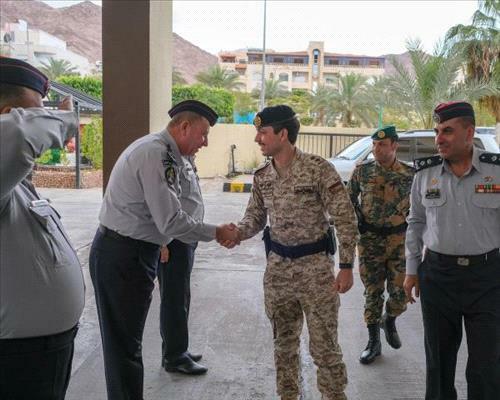 AMMONNEWS - His Royal Highness Crown Prince Al Hussein bin Abdullah II on Monday visited the Aqaba Civil Defence Directorate (CDD) and met with a number of its personnel. Crown Prince Al Hussein listened to a briefing by Aqaba CDD Director Lt. Col. Mohammad Majali on the directorate’s duties and the services it provides to citizens and visitors. His Royal Highness commended the advanced level of CDD personnel, in terms of readiness and performance in the field. The Crown Prince said the tactical exercise conducted by the CDD recently in Aqaba, in cooperation with specialised military and civil institutions, contributes to enhancing personnel’s efficiency and readiness, in line with what His Majesty King Abdullah, the Supreme Commander of the Jordan Armed Forces,-Arab Army, calls for.